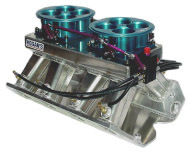 These units are made from 6061-T6 aircraft billet aluminum in our CNC machining center. They are top of the line. 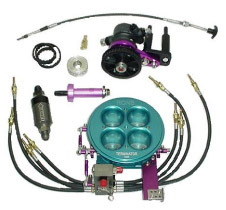 The Terminators feature 4-butterflies for smoother partial throttle applications such as throttle stops. 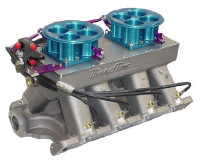 Our premium injection units work great for drag racing, circle track, sprints, boats and tractor pullers. This unit is for a turbo charger with 2 sets of nozzles and a pressure valve to open the second set of nozzles under boost. *Longer shut-off cables are available. The 1150 cfm bolts to the 4150 & 4500 tops.